I’ve been remembering someone who changed my life. He has been gone years now; his name was Micheal Pass, my first therapist. I was barely in my 20’s and self-destructive didn’t come near describing me. He said he liked my art and, even if I paid him, he listened. Naturally I fell profoundly in love with him. The therapy term is transference. Just to be clear, he had a huge mole right next to his nose and chain-smoked through our sessions. It was that long ago. And for what it’s worth, I loved his wife, too. In our work together he managed to steer my unspoken love through a barrage of obstacles, around back to me. 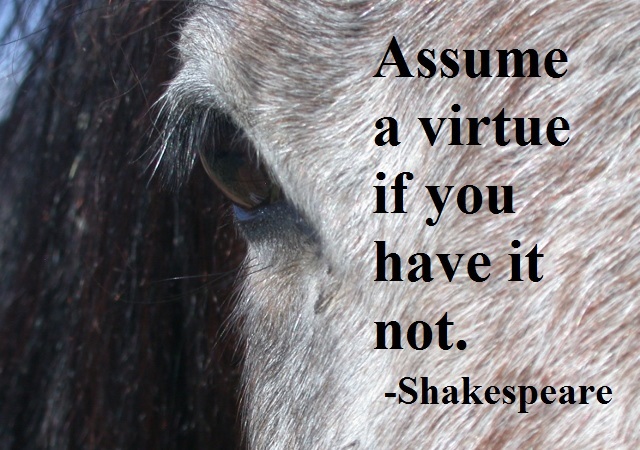 When I was the most doubting of my self-worth, he used this Shakespeare quote: “Assume that virtue if you have it not.” It was a more literary way of saying fake it till you make it. I debated it with him–acting out a lie didn’t make it true. Brutal honesty appealed to me more than cheesy fibs. I came from a family of realists, in the worst sense of the word. I was a slow study. The word that stuck in my throat was virtue. Could I assume a virtue, even as bad as I was, and have real change come into my life through a lie? Even a positive lie was still a lie, right? I decided to pretend to be more like my dog. Ends up, you can imagine yourself a whole new life. Sure, it takes a committed while, and I had more than a few demons to exorcise along the way, but change is possible. My confidence has been remodeled a few hundred times from the tiny framework he helped me build all those years ago, but I still recognize Micheal’s handiwork at the foundation. And this pasty, egg-headed literary quote has served me well, through one unlikely adventure after another. If you use it long enough and you just say, why not? Why not send your manuscript off to publishers? Week 9 didn’t bring even a small nibble on the manuscript. I waited on the couch, sick with sinusitis, and all the affirming I could manage didn’t stop my rib-splitting cough. I made a temporary, but strategic retreat to chicken soup and ice cream. I notice on a good day, confidence is a moot point. The real test comes during a long siege. Well, take all the time required. I’ve thrown Shakespeare in front of greater challenges than this; we’ll be right here. And thanks, Micheal. I think you’d like this book. So, Readers, any advice that has stuck with you over the years? Any unsuspecting hero you’d like to give a grateful nod to? Last year or so, I listened through a TED podcast. Actually one of my first TEDs. She suggested: Fake it until you become it. One of the more profound talks I’d ever listened to. Even if I wasn’t raised to succeed in something I could ask myself: What does a successful person in this field do? Even more to the point: How does a successful person act/speak/behave? Hasn’t helped with my housekeeping but it has more than once pulled me out of a deep abyss. Then I found out, more often than not, these successful people were faking it right along with me. You keep on keeping on, Anna. We’re all in this together! Thanks, Monica, and yes we are! I am also a huge fan of podcasts, especially Ted Talks. Thanks. Two hero’s and one motto that I try to live by. First hero was, like yours, my first therapist. He was a high school psychologist that I started seeing mostly because I could smoke in his office. He put up with a lot of my BS and angst, I suspect because he saw right through the tough girl act. And he loved me (in the most platonic way) and wasn’t afraid to recite my worth aloud. The second hero is my mother-in-law; the most gracious, non-judgmental, sincerely caring person I’ve ever known. I’ll never be able to claim that I didn’t have grace modeled to me, and shame on me if some of that didn’t rub off. Lastly, my motto is ‘gotta wanna.’ Nothing happens in life without a heaping helping of ‘let’s get ‘er done.’ Nothing. I’m responsible for getting the ball rolling and if I don’t want to invest my time and energy in something then you can bet it’s not going to happen. If the battle with attitude has been won in your head, the body is likely to follow. If this is what tough girls with alot of ‘gotta wanna’ look like a few decades later, I’ll take it. And really, the ones who first didn’t look away… God love ’em and I try to do the same. (And I do think some of that grace rubbed off…) Great comment, thank you. I think sometimes all the wisdom of the universe is contained in Shakespeare’s work.